It’s that time of year when some will surf the net looking for seafood recipes. In many Italian households, you see, Christmas Eve will be celebrated with a Feast of the 7 Fishes … or 11 Fishes … or 12 Fishes … or 13 Fishes. The number itself is dependent upon: a) the number of Christian Sacraments (7); b) the number of Apostles minus Judas (11); c) the number of original Apostles (12); or, d) the number of original Apostles plus Jesus (13). No matter how or why you count them — and there are more versions than those I’ve listed — that’s a lot of fish dishes. I doubt that today’s recipe was ever served at either home of the two-flat. The fact is, either cuttlefish (sepia) or squid (calamari) would have been served but never both in the same pot. Believe me. Initially I had no intention of doing it either. The fact is that the fishmonger was out of fresh cuttlefish and the box contained fewer than were needed to make today’s dish. As luck would have it, that was the only box that he had. It had been decades since either Zia or myself had even seen cuttlefish and I wanted to surprise her with them during the last Visitation. So, I bought some fresh squid and decided to sail into uncharted culinary waters. 1 lb raw cuttlefish, skinned, cleaned and cut into strips. If using tentacles, cut in half. 1 lb raw squid, skinned, cleaned, and cut into rings. If fusing tentacles, cut in half. Heat oil over med-high heat in a medium, heavy bottomed sauce pan. Add the anchovies, garlic, and red pepper flakes before reducing heat to med-low. Cook for about 2 minutes. Do not allow garlic to burn. 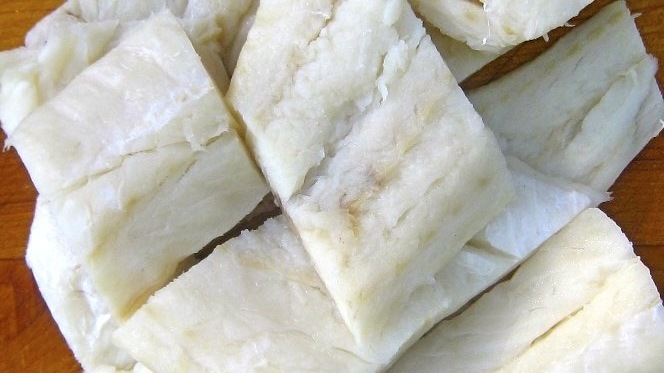 Add cuttlefish and squid and continue to cook until flesh whitens – about 5 minutes. Add wine and increase heat to med-high. 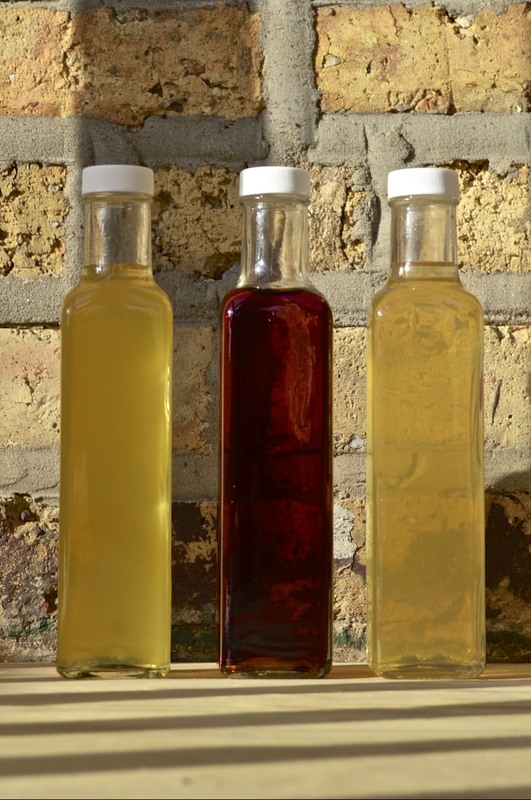 Continue to cook until wine is reduced by half – about 7 to 10 minutes. Add both cans of tomatoes, tearing the tomatoes by hand as you add them to the pot. Combine the parsley and basil and use 3/4 to season the pot. Reserve the rest. Stir to fully combine. Reduce the heat to medium and allow the pot to simmer for at least 20 minutes. 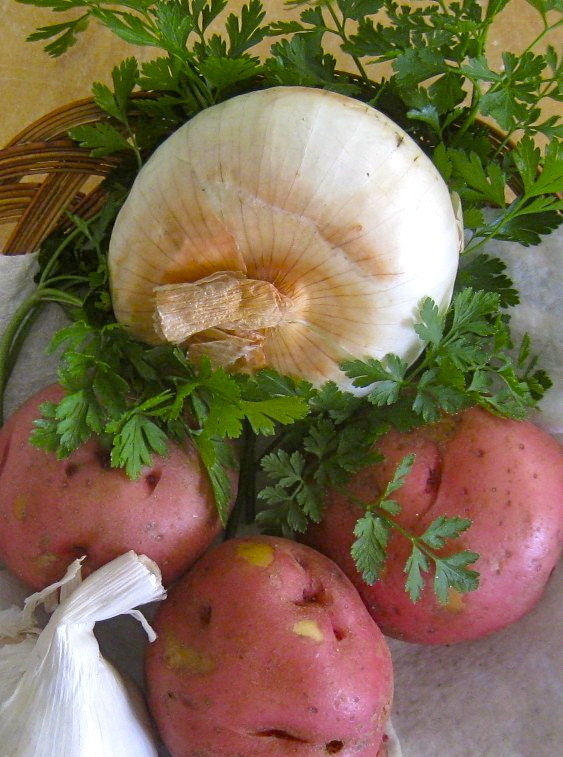 It is ready to be served when the stew has thickened and grown deeper in color. Bring to the table garnished with the remaining chopped basil and parsley. into the bottom of each serving bowl. 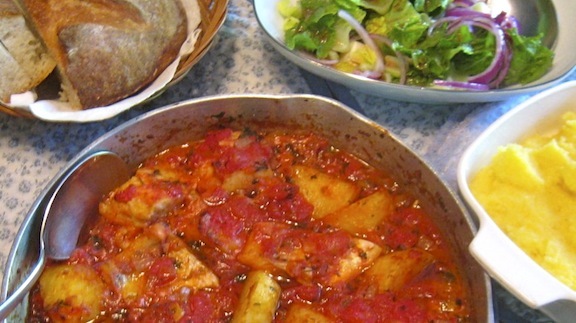 When it has finished simmering, ladle the stew over the bread in each bowl. Buon appetito! 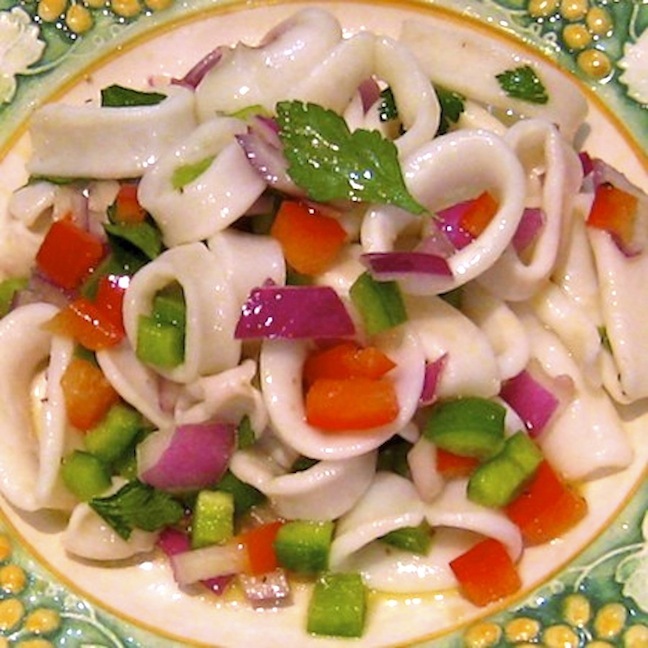 When cooking cuttlefish or squid, either cook them for less than a minute or more than 45 minutes. Anything in between will result in seafood with the texture of rubber. Because this is a stewed dish, if in doubt, taste a piece. If it’s chewy, continue to cook until tender. As you know, I work alone in the kitchen, taking all the photos as I go. Normally, there isn’t a problem that a time delay and remote shutter cannot handle. Cleaning squid, however, is a different matter completely. Being the ham-fisted person that I am, there really was no way for me to capture the cleaning without in some way impacting my camera. Is squid juice corrosive? I didn’t want to find out, so, I’ve found a video that will teach you what you need to know about cleaning squid — all in under 3 minutes. Enjoy! How to clean squid. 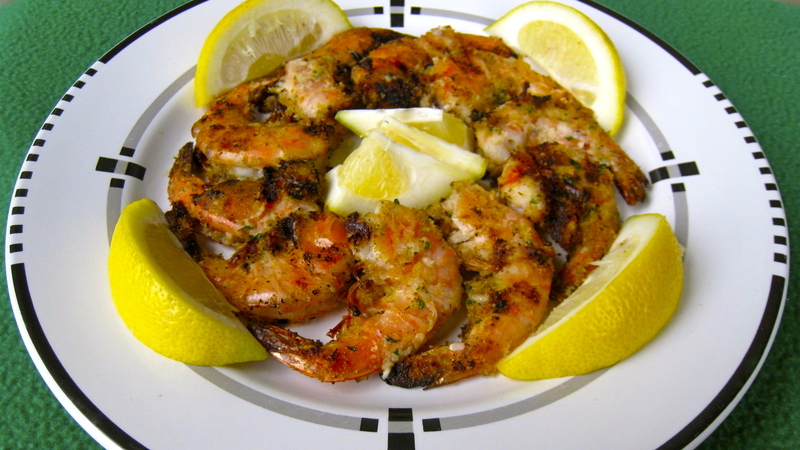 This is another seafood dish in which the flavors are relatively mild. Using grated cheese would pretty much obliterate them. Save that cheese for some other dish on the night’s menu. 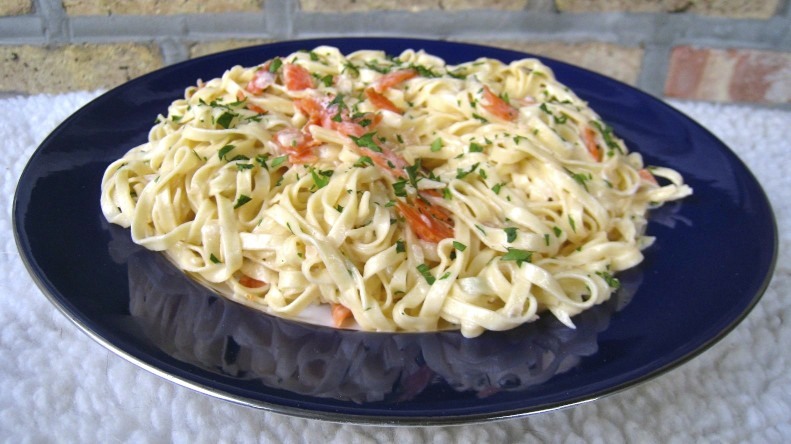 Whether you choose to serve this dish individually, with each dinner guest receiving a packet, or en masse, with a large packet placed in the table’s center, few dishes will delight your table mates like Linguine with Seafood in Parchment. After all, who doesn’t like receiving gifts this time of year and this one comes with a fantastic aroma that’s released upon opening. It doesn’t get much better than this and you can learn all about it HERE. I do enjoy going to the fishmonger. I may go in with something in mind but I always leave with something else entirely. One of my last visits is a case in point. This particular Tuesday I went shopping for chicken. My fishmonger is the only place in town that I know of where you can buy fresh, never frozen, organic chicken. I left with a chicken — and a little more than a pound of “Vancouver blue clams”. I just couldn’t resist them. 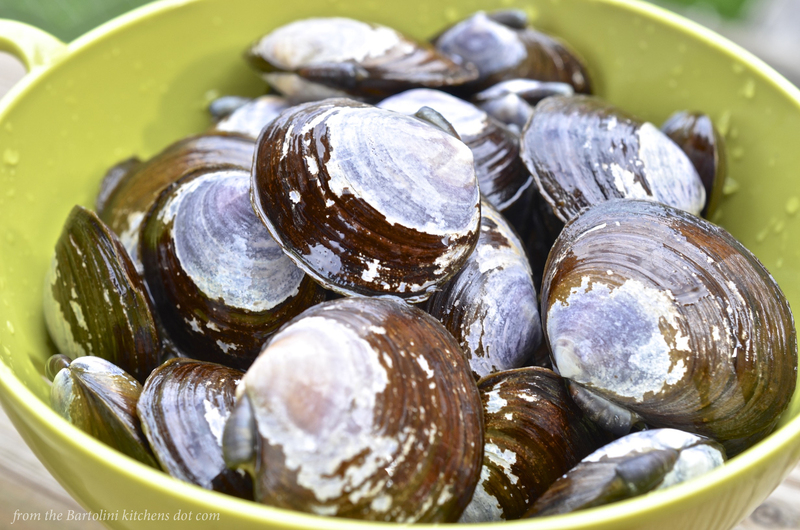 These clams were small — about the size of manila clams — and there were 36 of the beauties in my purchase. Best of all, they’re mighty tasty. In fact, I’m already thinking of going back for more. Once home, I decided to try something different. Believe me. Deciding not to cook them with linguine was one of the toughest culinary decisions I’ve made in a very long time. 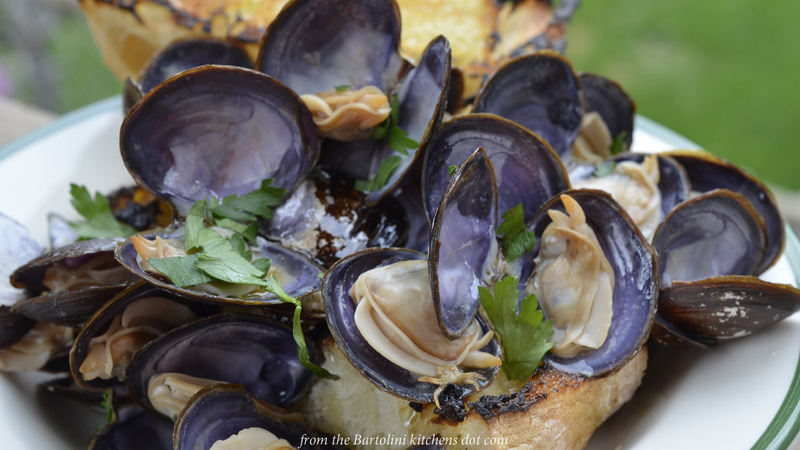 Even so, having watched a number of chefs grill clams, I thought I’d give it a try myself. The chefs placed the clams directly upon the grill grates, let them open, and then carefully removed them to a serving platter. That wouldn’t work for me. Being so small, I envisioned watching them open and spilling their delicious juices on to the flames. They’re simply not large enough to comfortably ride the grates. Worse, any liquids to have survived the opening would surely be dumped as I clumsily tried to move the clams to a platter. A cast iron skillet was the answer. First, though, the clams had to be cleaned. Using my food brush, the clams’ shells were scrubbed clean. 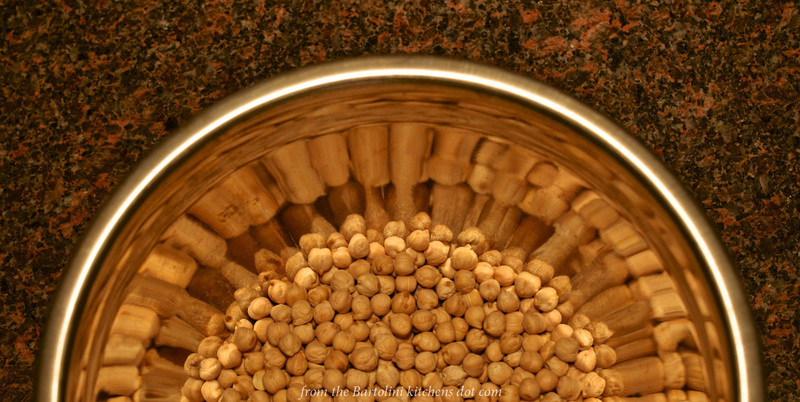 After that, they were placed in a bowl of cold, fresh water and left to soak for almost an hour. Midway through, the water was dumped and the bowl refilled. That gave the clams plenty of time to expel any sand. Clams that refused to close were discarded. The grill was lit and the flames set to high. Meanwhile, a lemon-butter sauce was prepared using 4 tbsp butter, the juice of 1/2 lemon, and 1 clove of garlic, smashed. The butter and garlic were gently heated in a small saucepan. When the butter just started to simmer, the lemon juice was added and the heat was shut off. The garlic was allowed to steep in the lemon-butter for a few minutes. Next, a 10 inch cast iron skillet was placed on the grill directly over the flames. While it heated, some fresh parsley was chopped and a chunk of ciabatta bread was sliced in half. The cut side of both pieces was lightly coated with olive oil and the bread was set aside. The clams were drained and returned to the bowl, along with a couple of ounces of both white wine and water. By now, the pan was screaming hot. 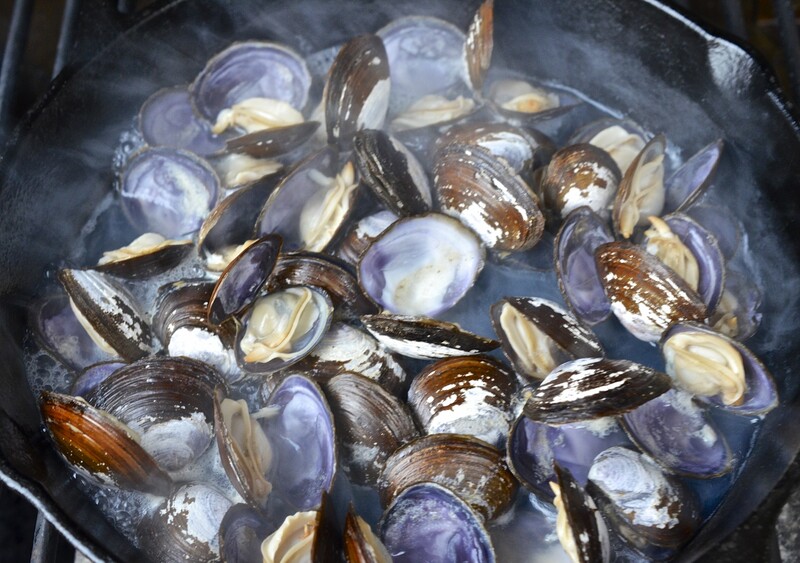 The clams with the wine mixture were poured into the pan and the bread was placed on the grill to toast a bit. The grill lid was then closed. Back in the kitchen, the garlic was removed from the lemon-butter sauce and the pan was returned to a low heat. 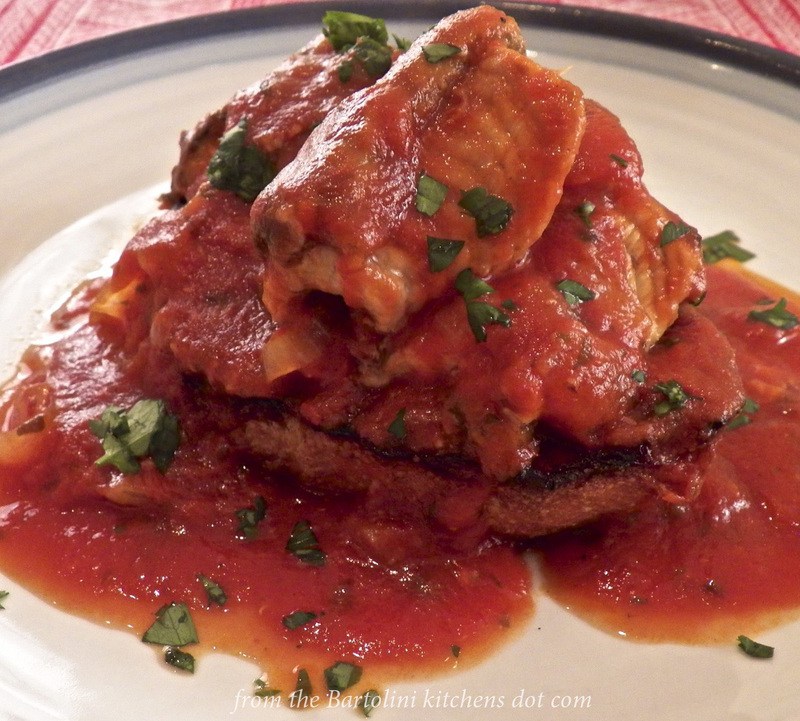 To serve, the bottom piece of bread was placed in a bowl and topped with some clams and a bit of the pan juices. The lemon-butter sauce was poured over the dish and fresh parsley was used to garnish. The top side of the toasted ciabatta bread was served on the side. Yeah. I’m going back for more clams, but it’s anyone’s guess what else I’ll bring home. Nothing but a Pasta with Clams recipe would be appropriate here. 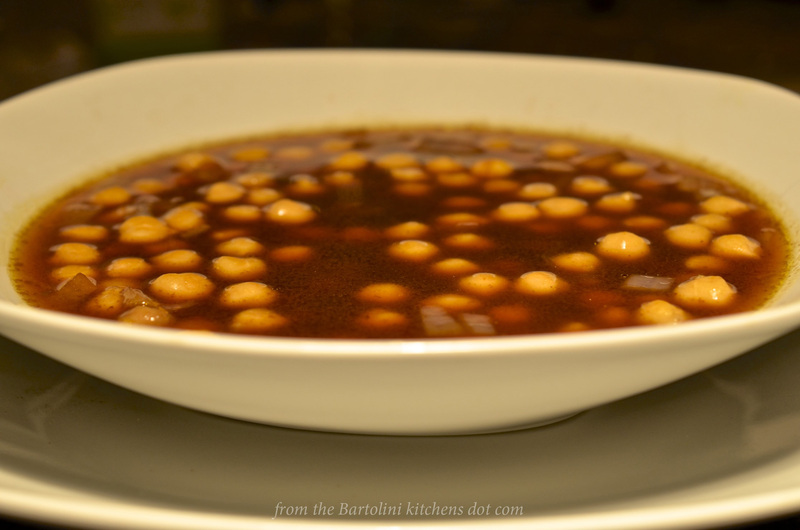 It is one of my favorite dishes and one I’m sure you’ll enjoy. You can see how the dish is prepared simply by clicking HERE. We Bartolini are an ecumenical lot. Whether you celebrate Hanukkah, Kwanzaa, Christmas, or even Festivus, we hope your holidays are of the most memorable kind. 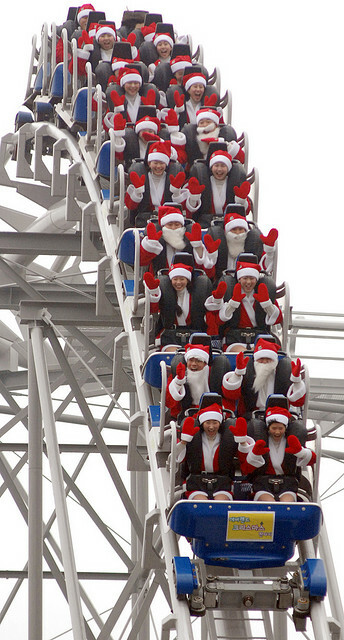 Although this is my 4th Christmas Eve on WordPress (I know! FOURTH!?!?! ), this is the 3rd time I’ve used the occasion to highlight seafood. In the past, I shared a tongue-in-cheek tale of how Italian Catholics prepared a Feast of the Seven Fishes to get around the Church’s rule of not eating meat on Christmas Eve. To be sure, the Church’s original intent was to keep that day, the last of Advent, a day of refection and sacrifice in preparation for the Christ Child’s imminent arrival. Some of the faithful, however, couldn’t wait to get the party started, so, instead they prepared a seafood feast. To avoid the Church’s wrath, they prepared 7 different dishes, 1 fish for each of the Seven Holy Sacraments. With their Church leaders appeased — many of whom were enjoying their own, even more lavish, seafood feasts — a tradition was born. Today, feasts of 10, 11, and even 12 seafood dishes may be prepared and served. I think it was Mom who told me about Nonna (Zia’s Mother-in-law) cleaning cuttlefish, sepia. 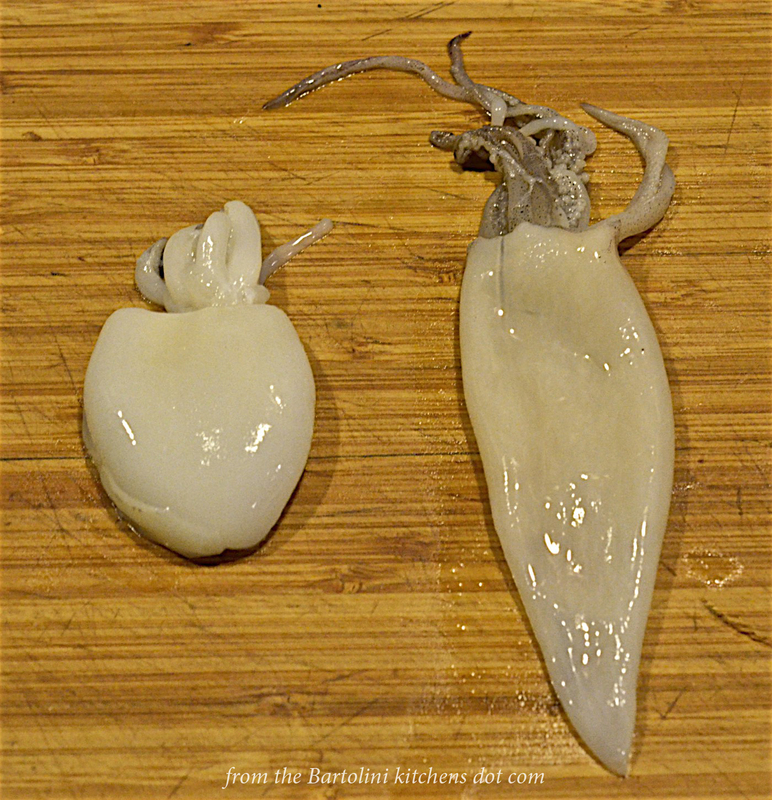 A cousin of squid, sepia are often prepared in very much the same ways. (Those who have owned parakeets, “budgies”, often hang cuttle bones in their cages to be used by the birds for beak maintenance. These “bones’ are removed from large cuttlefish during cleaning.) Nonna’s sepia were quite fresh and had to be gutted and cleaned. As I recall, if she was lucky enough to come upon a sepia’s ink sack, Nonna reserved it and used it to make black pasta noodles. The story stuck with me and, over the years, I’ve searched high and low for the illusive ink. I wasn’t picky. It didn’t matter whether I found squid or sepia ink. As my search criss-crossed Chicago’s ethnic neighborhoods, I cannot tell you how many dead ends I reached, having followed the advice of some well-meaning people who were sure that it could be found at this place or that. Dejected, I’d give up the search, only to begin it anew when some TV chef used squid ink to make pasta. Once, last year, I even purchased ready-made black pasta noodles. What a disappointment! This all changed about 3 months ago. Armed with a gift card given to me by Cynthia and Nigel for my last birthday, I went shopping at Chicago’s newest Italian market. (Cynthia and Nigel are the friends with whom I shared the flats in Florence and Rome.) As I passed the fresh pasta counter, I noticed they were selling black pasta. Upon asking, the clerk directed me to the fishmongers and, lo and behold, they had squid ink! Not only that but they had 2 kinds: 1, a large jar of thick paste, and, the other, a much thinner liquid, in packaging that would remind you of those ubiquitous soy sauce packets found at the bottom of every bag of Chinese take-away. After the fishmonger assured me that it would “last forever”, I bought the paste, thinking I could better control the amount used. On the way home, I decided that this would be the dish I would serve Zia for our Christmas dinner. What I haven’t mentioned is that, months before, I had ordered some bottarga online, intending to serve it to Zia some day. Bottarga is the dried and cured eggs of mullet fish. Thought to have Greek or Arabic origins, bottarga is a Mediterranean product and can be found from Portugal and Spain to North Africa. In Italy, it is most closely identified with Sardinia and Sicily, while here in the States, bottarga is now produced in Florida. (If interested, “locally” produced Bottarga is usually available this time of year.) 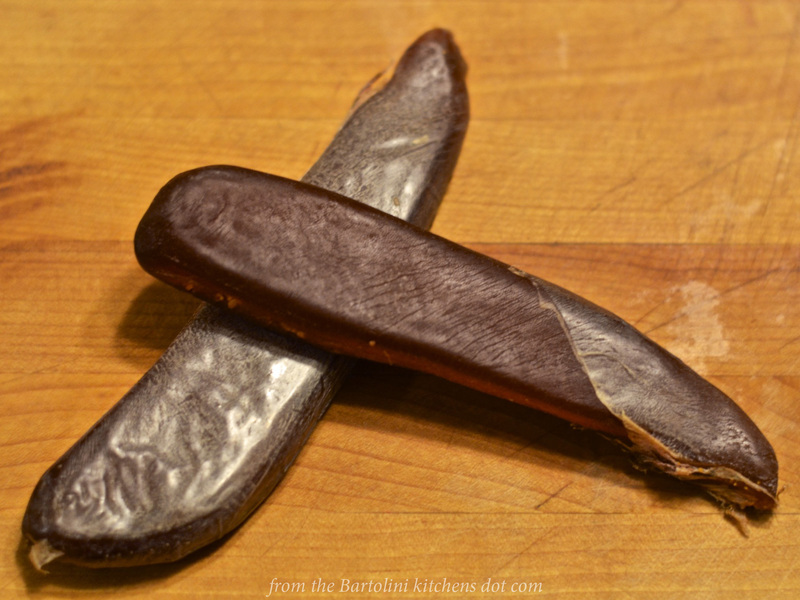 Bottarga can be bought dried in the original egg sacks, or sealed in wax, or both. Once purchased, if kept dry, it will last quite some time in the fridge. While its scent has been described as the “breath of the sea”, bottarga is bursting with umami, lending both salty and fishy flavors to your dish. To serve, some may shave thin slices which are then used to top off bruschetta or salads. Using a microplane or similar utensil, others will grate bottarga over pasta, risotto, grilled vegetables, broiled/baked/grilled fish, and even eggs. There is one thing about bottarga, though, that you should consider before rushing off to purchase some. Not everyone likes the stuff. Very much like anchovies, you either love it or hate it. Lucky for us, we all love it. It took no time to decide what would be the 3rd and final ingredient for our Christmas Eve pasta. 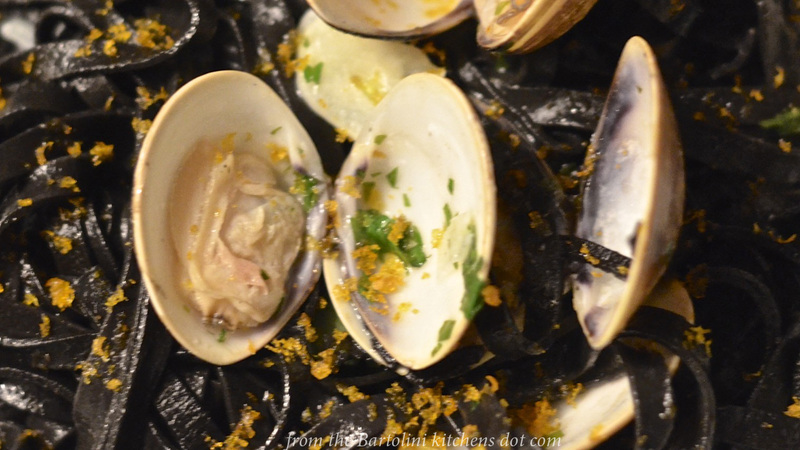 Both Zia and I love pasta with clams, vongole. Now, I always go to the Italian markets the day before I depart for Zia’s, buying her a few Italian staples that just aren’t available in her area. In the past, if the fishmonger has fresh clams — especially vongole from Italy — I’ll buy some, pack them in ice, and warn Zia that clams will be on the menu. That’s what I did just prior to my last visit, though the clams were the manila variety. I left the next day knowing that there was a great dinner in our immediate future. I served this pasta to Zia as our early Christmas Dinner. It was a complete surprise to her and to her son, my cousin the Max Whisperer, who was also seated at the table. Both thoroughly enjoyed the dish, as will you and your guests when you serve it. 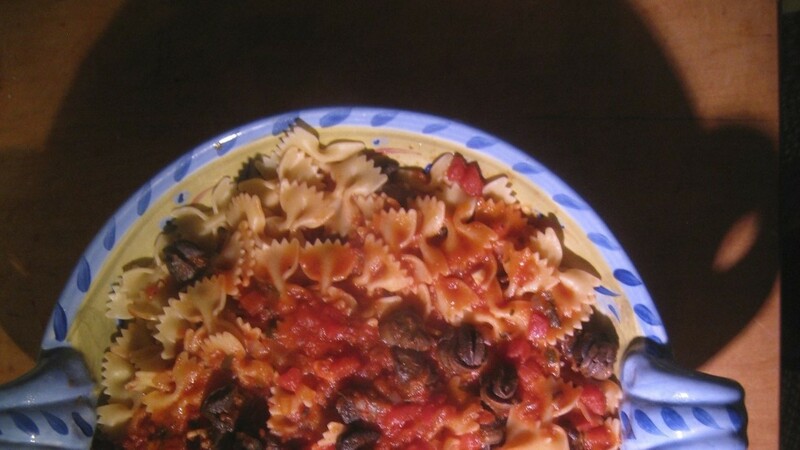 It is far easier to make black pasta than you might assume. Gather the ingredients required to make a batch of Mom’s Pasta Dough. 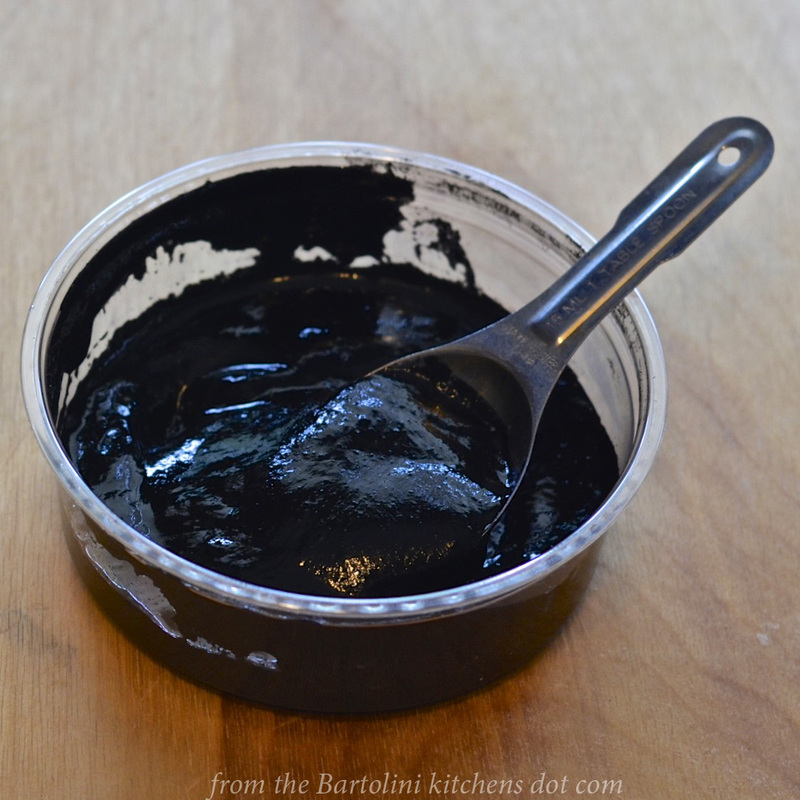 Once you’ve placed 4 whole eggs + enough water to equal 1 cup of liquid in a measuring cup, add 1½ tbsp of squid ink. Lightly beat the mixture to fully incorporate the ink. (See Notes) Proceed as your would when making normal pasta dough, cutting it, once dry, to make whichever sized noodles you prefer. (I made trenette because it most closely resembles the pasta that Mom would cut by hand.) Cook as you would normal pasta, removing it from the water just before reaching al dente. Reserve a cup of pasta water. Heat 1/4 cup olive oil over medium-high heat in a large fry pan with cover. Once hot, add 2 cloves minced garlic and sauté for about a minute. 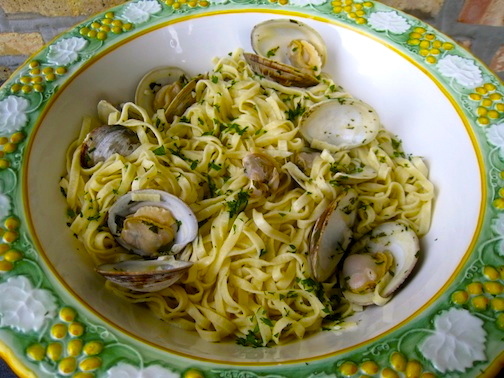 Add 1/4 cup water, 1/4 cup white wine, and about 3 dozen vongole. 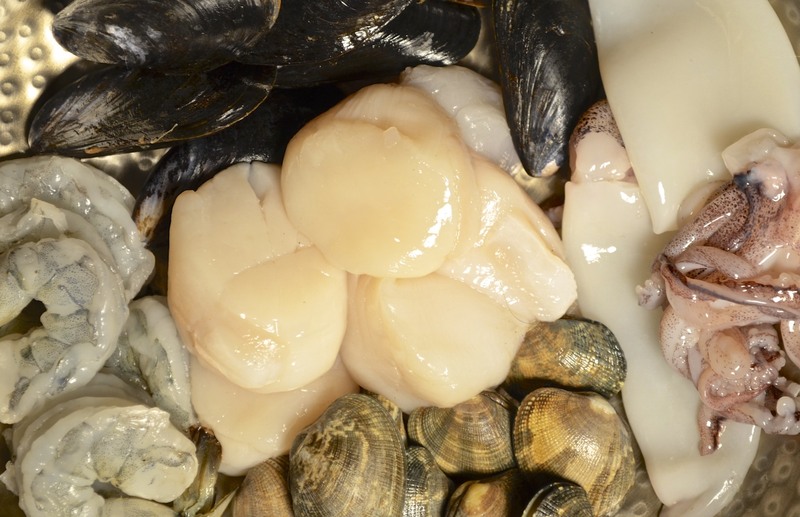 (Cockles, little neck, or manilla clams may be substituted.) Cover the pan and allow the clams to open, about 5 to 8 minutes. Do not overcook and discard any clams that have not opened by the end of the cooking time. Add about 3 tbsp of chopped fresh parsley. 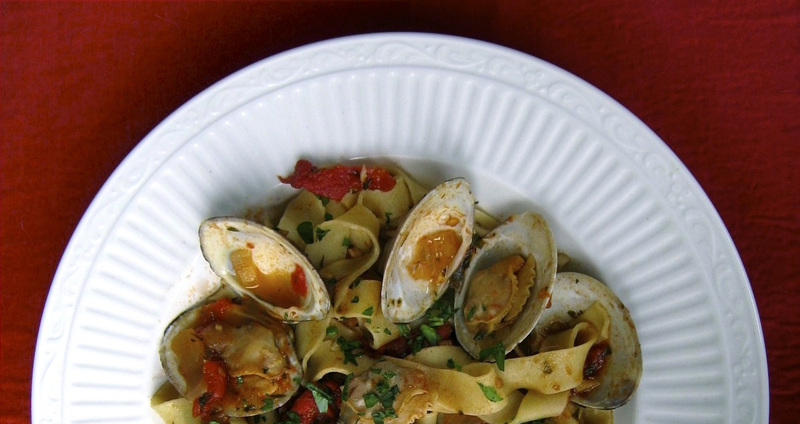 Once the unopened clams have been removed, place the newly drained pasta into the fry pan and toss to coat with the clams and pan juices. Add a little of the reserved pasta water if needed. Pour the pan’s contents on to a serving platter. 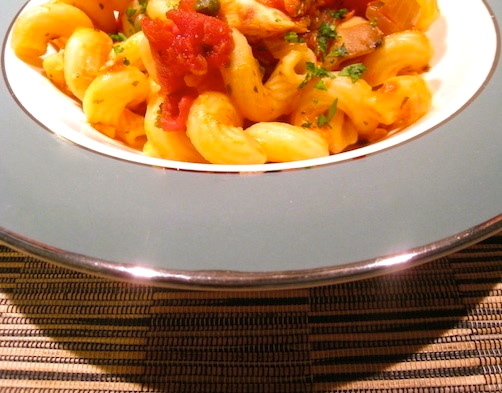 Drizzle a little of your best extra virgin olive oil on top of the pasta, followed by some chopped parsley. 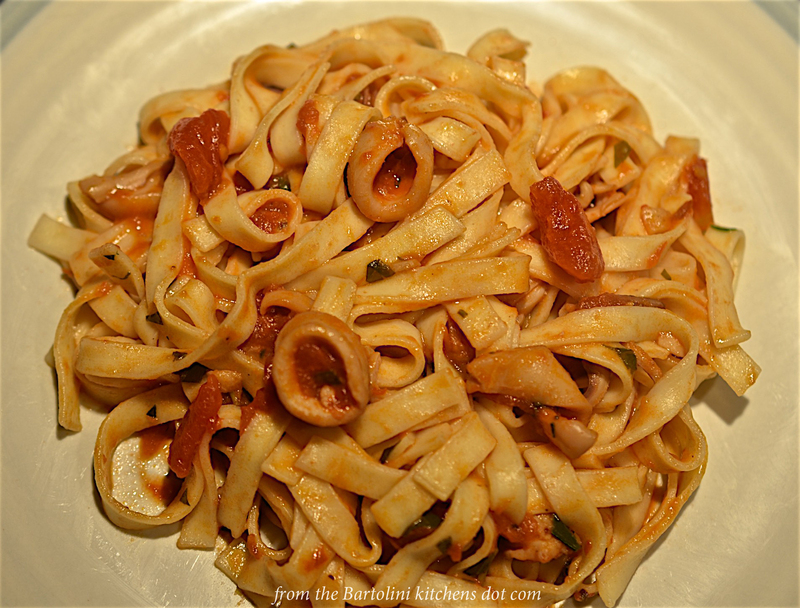 Grate, as you would a garnish, a bit of bottarga on top of the pasta and serve. Once your guests have received their serving, be sure that each receives another sprinkling of bottarga, whether you do the grating or they handle it themselves. Blending the squid ink with the eggs ensures that it will be evenly dispersed throughout the pasta dough much more quickly than if added directly to the flour. If, when handling the dough, your notice your fingers or work surface blackening, it’s a sign that your dough needs a bit more flour. Perfectly mixed flour will not “bleed” black. Clams must be inspected and cleaned before use. Examine your clams, discarding any with cracked or broken shells. Also, discard any that are open, even slightly, and that will not close when tapped on a counter top. Clams bought at most markets today usually have been purged of sand prior to purchase. You must purge the clams if you harvest them yourself or buy them directly from the fishermen. To purge the clams of sand, place them in a deep bowl and cover with room temperature water. Soak for 30 minutes, empty the water and, repeat the process at least another time. Once purged, use a small brush to scrub the shells. Again, discard any that remain open — even a wee bit — during the scrubbing process. Clams are now ready for cooking. 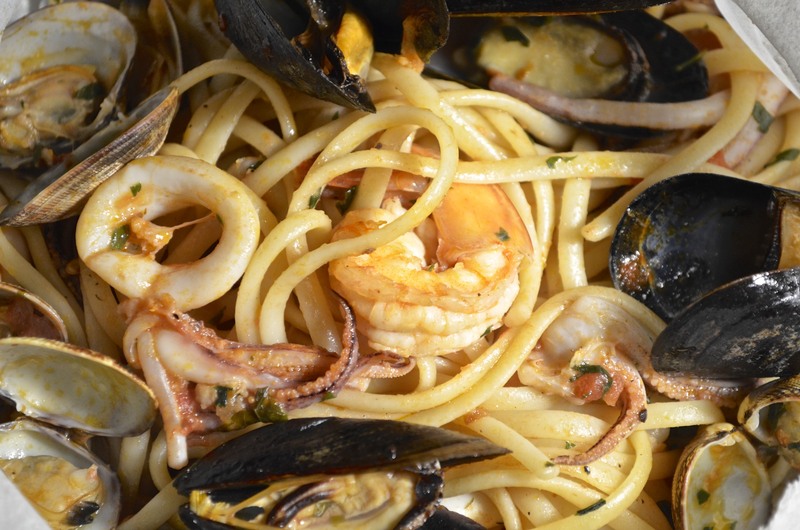 The Italian custom of avoiding cheese with most seafood pastas is not some “silly” or “ridiculous” decree. The suggestion is based on the fact that many forms of seafood are quite mildly flavored. Use of Pecorino Romano or Parmigiano Reggiano would easily overpower the seafood, rendering it almost “invisible” to the palate. 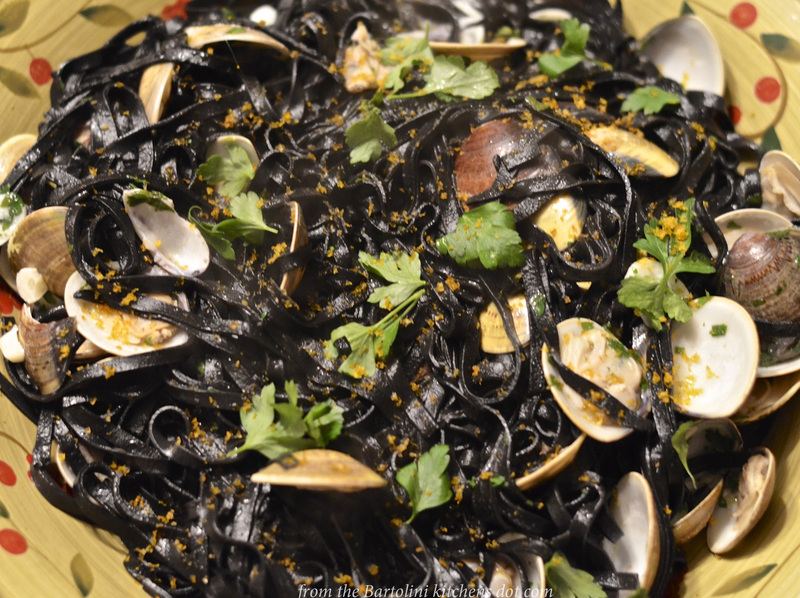 In today’s recipe, cheese would most certainly mask the delicate flavors of the squid ink pasta and clams, as well as obliterate all of the bottarga’s scent and much of its flavor. Of course, you can eat whatever you like but if you take the time to seek out and purchase fresh seafood, often at premium prices, why hide it under a blanket of cheese? It was but a year ago when I shared another seafood dish worthy of any Christmas Eve celebration. 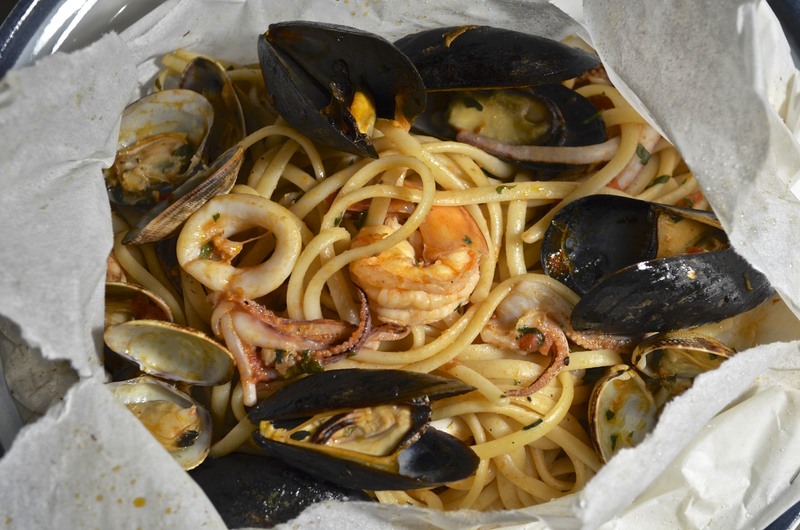 In that dish, clams, mussels, shrimp, calamari, and scallops were combined with linguine in a mildly spiced tomato sauce and sealed in parchment before being baked. It is a very special dish for a very special night. You can learn how to prepare it by clicking HERE. Our ship came in! This morning, I made what has become a daily call to the Italian market and learned that eels had been delivered late yesterday afternoon. I called a friend and within an hour, we were standing in front of the fish counter, watching the fishmonger net today’s entrée. Not but a few hours later, here I sit blogging about the dinner. Not too shabby, well, unless you happen to be an eel. Throughout much of Italy, eel is a dish served traditionally around the holidays but is most commonly prepared in the southern portions of the country, with Naples famous for its eel. Very often one of the fishes served during Christmas Eve’s Feast of the 7 Fishes, eel is considered to be good luck for those who eat it. This is a very old custom dating back to the days when people believed snakes to be evil because of their role in the story of Adam & Eve. Because it so closely resembles a serpent, by eating eel one was symbolically triumphing over the devil and good fortune was sure to follow. I don’t know if that’s true but I’m buying a few lottery tickets, just in case. In the old two-flat, I can’t say that eating eel was a tradition at all. In fact, I only remember seeing it one time back then. I must have been no more than 5 years old because I could barely see over the edge of the sink. Even though “barely,” I did manage to get a glimpse of a sink full of the slimy devils. Needless to say, it was a sight that left a lasting impression. Speaking with Zia, that is probably the last time eel was prepared there. So, today’s post wasn’t just a recipe. It was yet another memory test for my long-suffering Zia. I must say, though, having just finished a delicious dinner, Zia came through again. The eel flesh not only remained intact, it’s flavor wasn’t overcome by the tomatoes and, in fact, the sauce had a mild seafood taste throughout. Now I just have to figure out a way to get some eel over to Michigan so she, too, can enjoy the fruits of her memory. As she suggested, I prepared the anguille like we do much of our seafood, in a simple tomato sauce. 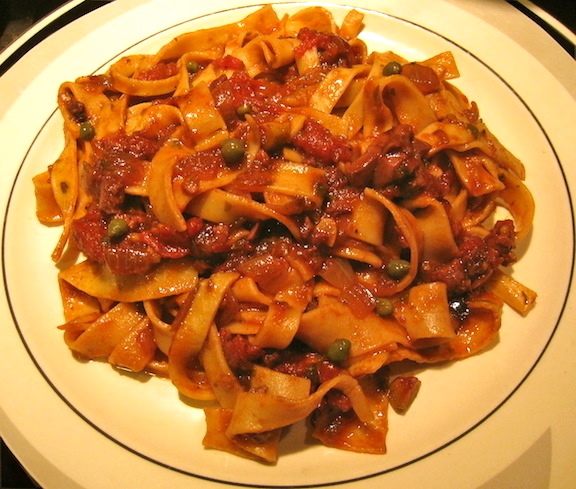 In fact, this marinara is almost bland for there are no strong herbs or flavors present. Eel has a mild fish flavor and using something like organo or marjoram would definitely overpower it, leaving a tomato sauce devoid of any taste of seafood. We agreed that the eel might disintegrate if allowed to cook entirely in the sauce, so it was briefly pan-fried before being added it to the tomatoes. Beyond that, the only change I brought to the recipe was with the basil. My family always tore by hand or chopped fresh basil before adding it to a sauce. Not long ago, I watched as Lidia added an entire stem of basil to her sauce and fished it out before serving. Well, if it’s good enough for Lidia, it is certainly good enough for me. If you, however, don’t feel like adding a stem of fresh basil, then tear or chop away. Oh! I should warn tell you one more thing about today’s protein. These eel are alive when purchased. You can bring them home and “take care of them” yourself or you can let your fishmonger do it for you. Um. No question. Let your fishmonger kill, gut, trim, and even chop the eel to your specifications. If you’re considering taking on any of the duties I’ve just mentioned, let me tell you that the term “slippery as an eel” is far more fact than fiction. I chose to chop the eel myself and it was a mistake, one that I’ll never repeat. 3 lbs. 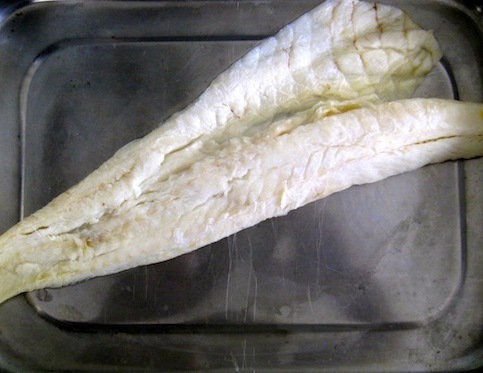 eel, cleaned with head & tail removed, chopped in 2 – 3 inch pieces. thickly sliced, toasted Italian bread, for serving. In a large sauce pan, heat 2 tbsp of olive oil over med-high heat. Add onion and sauté for about 3 minutes before adding 3 tbsp of the chopped parsley. Continue to sauté until the onion is translucent, about 5 more minutes. Add tomatoes, basil, season lightly with salt & pepper, and bring pan’s contents to the boil before reducing to a simmer. 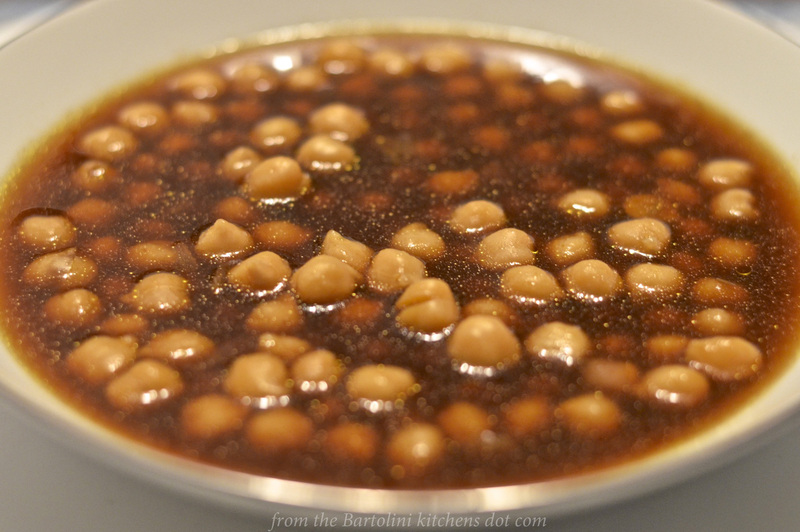 After sauce has simmered for 15 minutes, heat the remaining oil in a large frying pan over med-high heat. Once the oil is hot, add the pieces of eel and sauté for about 7 minutes, being careful to insure that the pieces are evenly cooked. Carefully remove the eel and place it in the tomato sauce. Season lightly with salt & pepper. Use the white wine to deglaze the frying pan. Continue to cook the wine until it is reduced by half. Add the wine reduction to the tomato sauce and carefully stir the pan’s contents. Increase the heat to high, bring the sauce to the boil, then reduce the heat and simmer for another 15 minutes. Taste and adjust seasoning, if needed, one last time. To serve, set a piece of toasted bread on each plate and place eel pieces on top, followed by a generous amount of sauce. Garnish each serving with some of the remaining chopped parsley. A little over a year ago, I gave an account of how the Feast of the 7 Fishes came about. It was part of the post in which I shared Mom’s recipe for a Calamari Salad. 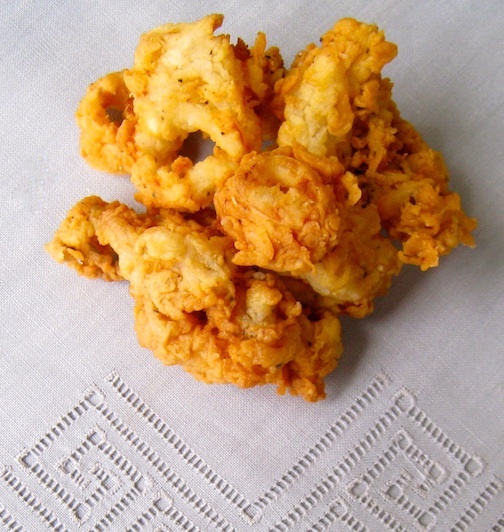 Follow this recipe’s guidelines and you’ll have perfectly prepared calamari, not rubber bands. That post also included a round-up of 11 additional seafood recipes for anyone needing help with gathering 7 seafood dishes for the Feast. You can see it all by simply clicking HERE. What’s this? You’re still a fish short? Here’s a round-up of this past year’s seafood posts. So, combining both posts, you now have 18 recipes from which to choose dishes for your Feast of 7 Fishes. Still having trouble? Try this: start your meal with Mom’s Calamari Salad. Next serve a bowl brimming with Brodetto. See? You’ve got 6 Fishes out-of-the-way already. Now, finish your meal with a bang: Branzino al Cartoccio. That’s 7 Fishes and you haven’t even broken a sweat. Today’s recipe comes from a half-century ago, a time when television shows were only broadcast in black and white; when a trip to the airport was something eagerly anticipated; when all (US) phones had a dial and many of those phones, being owned by Ma Bell, were rented; when music was purchased on large, black vinyl discs; and when Catholics were forbidden to eat meat on Fridays lest they face the fires of eternal damnation. Yes, that long ago. When I think back to those days, I’m amazed at the variety of fish that found its way to our dinner table. Aside from the usual guests — i.e., baccalà (salted cod), stoccafisso (dried cod), tuna, vongole (clams), smelt, calamari (squid), perch, sepia, lumache (snails) — there were infrequent visitors but I was far too young to remember their names. Zia, my very own Encyclopedia Italiana, can’t remember their names either. So, you can well imagine my surprise when the fishmonger at the Italian market identified a type of fish in his display case as “merluzzo.” Merluzzo! I’d not heard or seen that fish in almost 50 years. I bought a couple, rushed home, and phoned my Aunt immediately. Zia was every bit as surprised as I was. I really enjoy these phone calls and they’re why I spend so much time investigating a market’s pasta aisle, the cheese counter, the produce department, and interrogating the fishmonger. It makes my day when I uncover some treasure from long ago and then phone her with the news. To be sure, no matter the discovery, there’ll be some in a bag, a box, or a cooler the next time I come for a visit. And that dinner will be full of memories, some of which I’ll then share with you. Now then, before discussing the recipe, I can no longer ignore l’elefante nella stanza. Our friends from across The Pond refer to merluzzo as “hake”, whereas here merluzzo is called “whiting.” (My sources on this “side” being my fishmongers and Fabio Trabocchi’s cookbook Cucina of Le Marche.) Although I am by no means an expert, I’ve learned that although the two fish aren’t exactly the same, the names “whiting” and “hake” are used interchangeably. For the sake of argument, henceforth I’ll call today’s fish “merluzzo”. You, then, can translate it to mean whatever you like, be that “whiting” or “hake”. ChgoJohn, Peace Maker. I’m going to dispense with my normal recipe format, for this dish doesn’t need it. Merluzz’ are small fish. Scaled and gutted, the 2 pictured were about 9 inches (23 cm) long and together weighed about 8 ounces (227 g). To stuff them, you’ll need about 1/3 of a cup of the breading mixture per fish and you may wish to make more, depending upon how you’ll cook or serve your fish. This stuffing mixture is used in a number of the Bartolini family recipes. Grandma’s Stuffed Vegetables and Grandpa’s Barbecued Shrimp are 2 that I’ve shared so far. 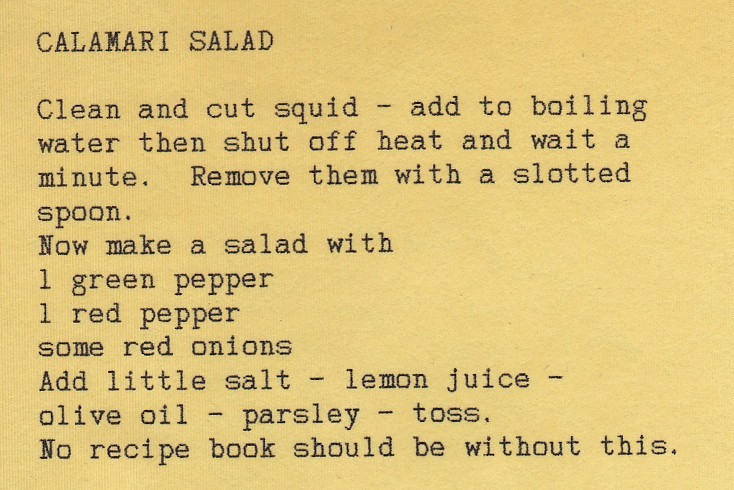 We, also, use it to stuff calamari and again with other baked fish, the recipes for which are forthcoming. 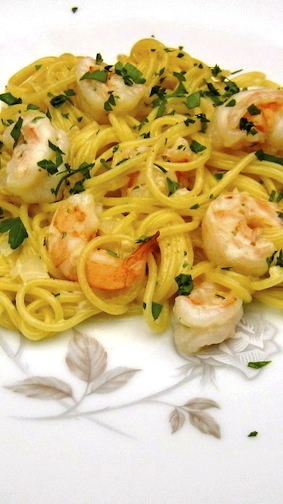 The only difference in its composition from one dish to the next is that, with seafood, lemon juice might be added. It’s easy enough to make. Just combine (Panko) breadcrumbs, chopped fresh parsley, a little grated or minced garlic, salt & pepper, and olive oil. If you like, squeeze a little fresh lemon juice into the mix. Learning how much olive oil to use gave me fits. I pestered Mom with questions and was forever touching Zia’s mixture to get “the feel” of it. You do not want a breading that is sopping wet with olive oil but neither do you want it barely moist. Too wet and you’ll have a greasy dish; not wet enough and it will dry out, and possibly burn, before the dish has finished cooking. Practice makes perfect. Once the breading is made, salt & pepper the fish, inside and out, use the breading mixture to stuff it, and add a light drizzle of olive oil. Back in The Day, Grandpa would then secure the merluzzo in a hinged grill basket and place them on his barbecue, turning them after a few minutes. When finished, they would be removed to a serving platter and brought to the table. As you can see, that’s not what I’ve done. 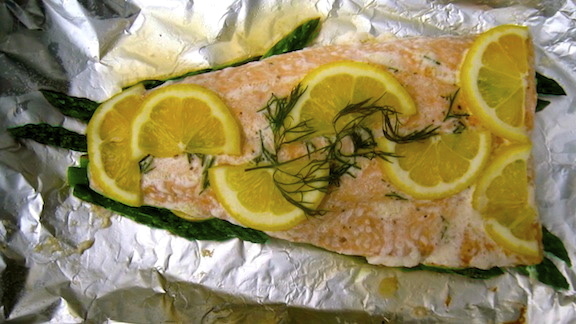 To bake, place the stuffed fish on a lightly oiled baking sheet. Place any excess breading on top of the fish before drizzling with oil, and then place in a pre-heated oven of 375˚F (190˚C). Bake for about 20 minutes or until the breadcrumbs are golden brown. Times may vary depending upon the oven and size of the merluzzo. 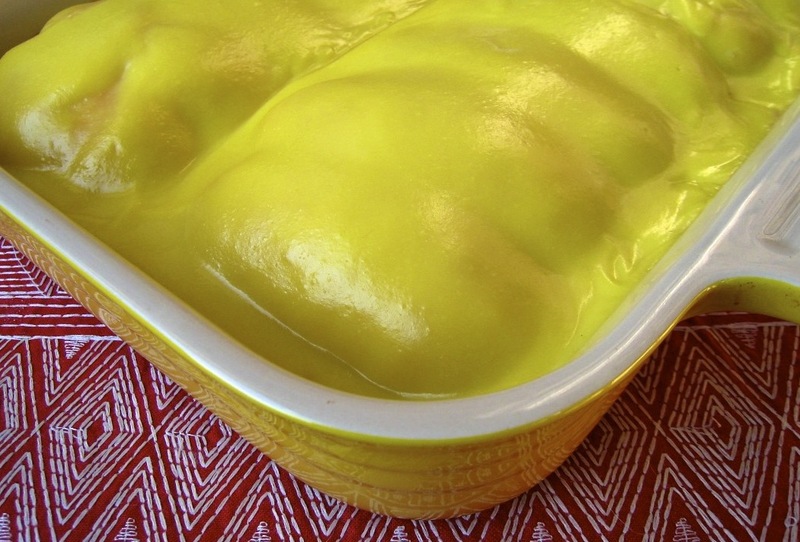 Remove to a serving platter and serve immediately. That’s still not as is pictured but this is how my family baked and served merluzzo. One way I like to prepare them is to roast cherry/grape tomatoes with the fish. I make extra breading and use it to cover the fish. Once roasted, the resulting flavors of roasted tomato and breading are reminiscent of Grandma’s Stuffed Vegetables. A third way to serve them is to prepare even more breading mixture and use it to as a bed and coating for the roasting fish. Once roasted, place the breading and fish atop cooked pasta that has been lightly dressed with olive oil and chopped parsley. Roasted cherry tomatoes would work here, too. 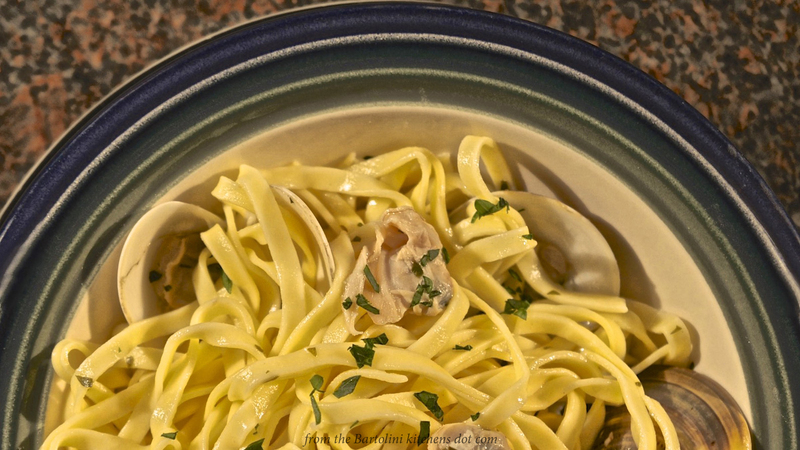 Don’t let a fear of fish bones prevent you from trying merluzzo. The bones are all attached to the spine and the “top-side” fillet readily lifts off of the fish with your fork. Once exposed, the entire spine is then easily removed, making the “bottom-side” fillet accessible. Just be careful with the meat taken from around the gills and you shouldn’t encounter any bones while eating. As I’ve said, seafood is the protein of choice in Italian households on the night before Christmas. 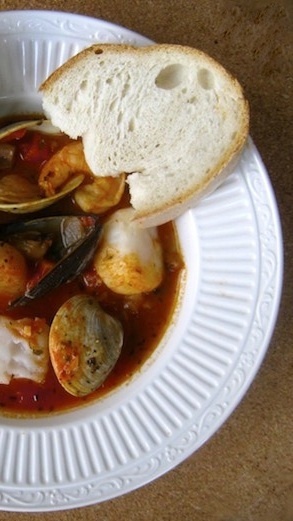 My Brodetto, or fisherman’s stew, uses a variety of seafood in a lightly seasoned tomato broth to create a very special dish which, coincidentally, is perfect for Christmas Eve. Click HERE to learn how to make this stew.